OLDRIGHTIE: A Sense Of Nostalgia. At The Start Of A New Term Or Year. This image, from my time at school, could be a metaphor for our present world leaders of today. A new term is beginning and no one quite knows what to expect. The common trepidation children still feel, after the long school holidays come to an end, pervades our political classes. During the long summer break much happened to interrupt the lounging aimlessly around. The school was badly damaged by fire, (Libya), somebody ran off with next term's teacher's wages, (The Euro) and endless teacher absences continue, quietly forgotten, in Afghanistan. In the staff room many heads of departments are raging about all the extra work on their itineraries whilst the threat of redundancy hangs over the least able. Miss Merkel expected to retire many years hence on full pay. The French Teacher is concerned he is about to lose his giant jet transport and massive salary whilst contemplating another mouth to feed, possibly of someone else's progeny. As for the Head of the English department, he's pretty chipper about his Arabian holiday, especially the nights. 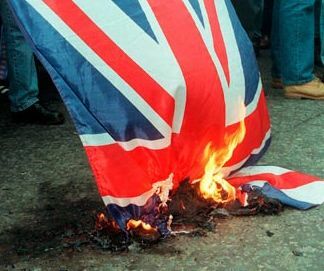 Of course the English head's cockiness is somewhat marred when many of his pupils' failure to learn English erupted into violence, book burning, looting and arson. The heated shouting, squabbling and animosity at this gathering for the new term has, naturally delayed the new day's start. This inaction and desperate struggle for supremacy by each department head threatens to derail the new term completely. We "parents" can only watch and wait with dread what may befall us and our children in the coming months. Ideally we would like a fresh new school where the discredited, poverty of morality, stricken staff of the present one are sacked. Their (I got "their" right for a change!) dreadful, woeful history of useless teaching, in particular home economics and PE, consigned to history. Their policy of giant classes of hundreds of rowdy, dysfunctional, multi-cultural mayhem children whittled down to manageable levels. Welcome back to school, everyone, intones the headmaster as the assembly finally gets underway. The gathering is muted, apprehensive and fearful as to what the new term will bring. Not least the unhappy, long faces behind the headmaster, whose name no one quite knows! Someone hinted it was a certain Mr Soros. Brilliant, OR, just brilliant - have retweeted yours! I am most flattered, WoW. Thank you. Did you see Schroeder's comments picked up by OoF? Joyous! No need to be OR. Yes did see the original mention on twitter on Sunday and retweet that - also mentioned it over at my place. It would seem blogging is noticed by The Federalists, so must be by our lot. So might we become the wimp's spine? As this austerity bites the plasma plebs and they hopefully realise whose at fault, bingo! It seems Ms Moran will shortly be getting detention too OR. ArtCo, good to hear from you. 21 charges for the Socialist robber. Somehow I expect it from the genes associated with the upper classes descended from robber barons, so it seems far worse when the "peoples'" Party are such thieving cretins. !